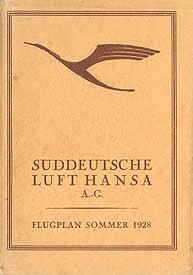 Süddeutsche Luft Hansa was one of over 20 regional airlines (most of them non-operating) affiliated with the national airline Deutsche Luft Hansa and in existence for a few years after the creation of the latter airline in 1926. It acted as the Southern Division ("Bezirksleitung Süd") of Deutsche Luft Hansa and was responsible for transfers to and from Munich Airport as well as ticket offices in southern Germany. All flights were operated as Deutsche Luft Hansa, not under the Süddeutsche name.